This post is number ten in a series during the month of December 2016, where we are reflecting on the things — issues, movements, and ideas — that give us a reason for existing here at Interference Archive. We wanted to take this time to think about what these critical elements and movements bring to us, and what we have to give to them. You can read parts one, two, three, four, five, six, seven, eight and nine as well. Black Lives Matter is rooted in building justice in a remarkably unjust system of violent police oppression and systemic racism against black people. In 2014, the murder of Michael Brown, Jr. led to a citizen uprising in Ferguson, Missouri which quickly grew international support. The years leading up to Ferguson had already seen a groundswell of organizing particularly at the time of the murder of Trayvon Martin by civilian George Zimmerman, the law enforcement killings of Rekia Boyd, Kimani Gray, Miriam Carey and so many more. As a social movement, Black Lives Matter has strength in being largely decentralized, with no clear leadership. It is important, however, to recognize that the foundation of the movement has been hugely impacted by black women including Alicia Garza, Patrisse Cullors, and Opal Tometi. Chapters of Black Lives Matter exist around the globe, and beyond that organizers under many different names have pooled their resources and power to break down institutional oppression, fight the police occupation of our communities, and bring an end to murders of black people by law enforcement. At Interference Archive we don’t just look back on organizing of the past, we look towards archiving and organizing around today’s largest threats to justice for everyone. Archiving the material of Black Lives Matter is one way we support current movements: we create a space where this history is valued, and where we invite movement members to be part of its re-telling. Other current movements are represented alongside Black Lives Matter on our shelves: you can find materials from Groups like NYC Shut It Down, Equality for Flatbush, and Dignity and Power. We believe that, as an archive, we’re facilitating “conversations” between these current movements and past ones, by preserving their materials alongside each other. 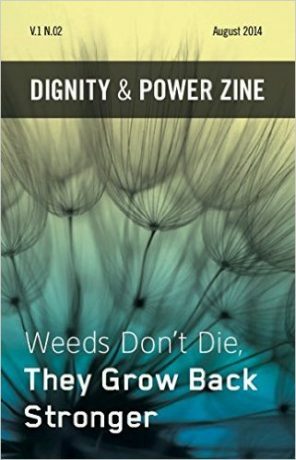 Produced by Los Angeles Based DPN, Dignity and Power Now! is an annual publication that seeks to cultivate and cross-pollinate our dreams for a more livable Los Angeles in the shadow of the prison industrial complex. The second issue focuses on the art and images that that have been produced by Dignity and Power Now members in the context of the organization’s work over the past year and half. This work includes the fight to hold the Los Angeles Sheriff’s Department accountable for their egregious treatment of people detained in the county jails.